This truly lovely photograph by a professional photographer (Harper of Hove) shows the construction of the Bates Estate in its early stages. It was taken for the Brighton Corporation in the summer of 1952 from a standpoint in the copse behind Birdham Road. The estate took its name from the Nursery which formerly occupied this extensive site. 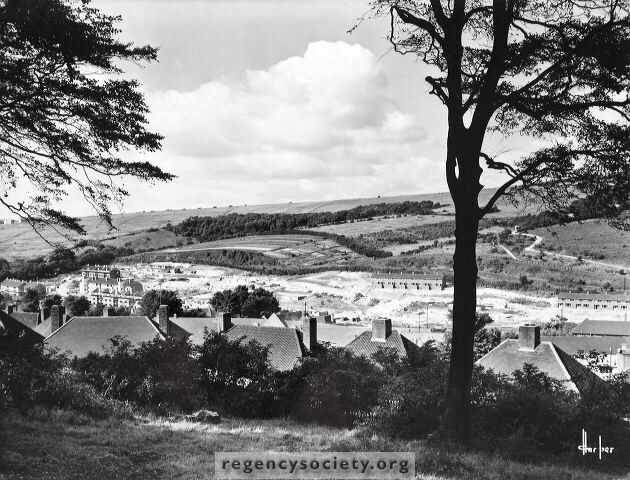 In the far distance can be seen part of the Hollingdean estate, which was being built at the same time. My name in 1953 was Sylvia Watts and I lived on Southall Avenue, Moulsecoomb. I remember Miss Carson was the very strict headmistress at Moulsecoomb School. Other teachers I remember are Miss Milledge, Miss Neate, Miss Holt, Miss Sharman, Mrs. Rutherford, Miss Smith, Miss Trist, and Mrs Caddick. When I was at school the Bates Estate was full of apple trees. We used to pick the apples and they were so good to eat. I remember two Allen West factories; one at the top of Dewe Road and the other in Moulsecoomb. As Moulsecoomb was an all girls school back then most of my pals were girls. Some of the names I recall are Jean Savage, Jean Owens, Brenda Lambert, Yvonne Tait, Olive Castle,Valerie Wingham, Maisie Castle and Marion Collins. I have lived in Canada for the past fifty years but often think back to my good old school days. I would love to hear from some of the people from way back then. So if any of these names ring a bell with you, or you would like to share your memories, please do leave a comment below. I went to Moulscoomb infants middle and senior in the 1950s- 1960s. Does anyone remember me, Shirley Jennings? I lived in Ringmer Road and would love to catch up with old friends. Sylvia, yes I was there at that time, and I do remember those teachers. I remember Miss Sharman standing at the front of the class and doing the reading from her book. She made it so real. Now was it Miss Smith or Mrs Rutherford who took the French lessons. She petrified me and I had a good thrashing with the ruler for daring to whisper back to someone (and it wasn’t my fault!). I also lived in Ringmer Rd from 1950/51,went to Moulsecoomb Infants & Juniors. Yvonne Tait became Yvonne Maslin and was a neighbour in Lyminster Avenue in 1972-78. I was in contact with her last Christmas, 2011. Hope she is OK. She has 2 daughters, Julie & Theresa. I went to Moulscoomb School but don’t think I was in this class, I think my sister Pat Croucher was though and maybe I was in the next class. My sister Pat and I went to Moulsecoomb School and our elder sister Ivy went to Varndean. We were Crouchers then. How great to come across this photo. It was taken before I was born by my father who was Geoff Harper of Harper Photography. Do you have any more of his work? I also went to Moulsecoomb School, infants, Juniors and the then All Girls Secondary Modern Senior School. I remember all those teachers except Miss Craddock, but Mrs Hutson the history Teacher and Miss Mitchell the maths and geography teacher were all very good teachers – did not stand any nonsense but got their message across with out too much trouble. It was a very happy school. My class mates were Pat Glyde, Elaine Green, Gloria Huen, Carol Wales and Mary Davey and several more. Not sure where they all are now but I now live in Wiltshire having lived in Singapore and Spain – a very interesting life all starting from Moulsecoomb. I lived in Birdham Road at the time a very nice road in its day and then moved down to the newly built Bates Estate with my Mum when my Dad died in 1958. I was at Moulsecombe Girls Secondary school between 1952- 1956 and I well remember most of the teachers mentioned here. In particular I remember Miss Mitchell the maths and geography teacher. Miss Mitchell, Audrey Mitchell, became headmistress of Moulsecombe and then I believe she moved to Patcham Girls school. I owe Audrey Mitchell a huge debt. She taught me to play chess after school hours, and encouraged my love of Geography and Geology. Unfortunately I was totally hopeless at Maths, much to Miss Mitchell’s and my astonishment. However to cut a long story short – I studied hard after I left school at 15,and later became a teacher myself – my teaching subject – Maths! As I had struggled so much with this subject as a teenager – I was able to understand my pupils much better when they struggled too! I also remember Miss Moore the French and Music teacher and Joan Dawson the Arts teacher. In later years I wondered why most of the women teachers were unmarried. Maybe because their boyfriends died in the war- or maybe because women had to give up teaching prior to 1940 if they got married! My best friends at school were June Godfrey, Caroline Puddick and Rita Munnery. I also went to Moulsecoomb Secondary School from 1960-1965 having previously been to the infants and primary School. I had a brief time in my Secondary years at Fairlight School and came back to Moulsecoomb. I also remember Miss Mitchell, but for her stern dress code and stern looks, I struggled a bit with School once we merged with St Lukes Boys School and our school then became mixed. I loved netball and all the sports at school, and I can’t remember the name who set up the netball team for outside of school games, we played several times down at the level. I caught up with my education at college after leaving school, although like Celia my maths was poor I went on to love computers, and became an IT trainer. Hi all. I went to Moulsecoomb from the infants in 1958 through to when I left the seniors in 1967, my sisters Irene and Linda both did the same only earlIre. Irene from 1955 and Linda from 1954 (born in 1947, in her earlier years she attended a school in Brighton near Elm Grove). I remember Miss Mitchell very well and yes she did leave to join the girls school in Patcham (Margaret Hardy at the time) where she taught my sister Linda’s eldest daughter (or tried to!). The last lesson I remember with Miss Mitchell was a debate on politics and would there ever be a woman Prime Minister, at that time Barbara Castle was the female high-flyer. I went to the senior school just after they changed from boys one side and girls the other, to co-educational both together. At that time Mr Sharp was the headmaster, we seemed to meet quite a lot in those days. I see mentioned in one response girls getting the ruler, the boys got the cane back then, it didn’t work. Three of us in my class had a competition one term to see who could get the cane the most. The masters that caned the most were music teacher Mr Drakeford and Geography teacher Mr Catchpole. My family lived at 47 Birdham Road when we first moved there but later moved to 112 Hillside, the road by the junior school gates. I remember old Bates farm and his orchards, alas all gone now, his farm is now an industrial estate. I still live in Brighton, our old school is now first and middle, all the old walkways have been framed and glazed so no more throwing things down to people in the playgrounds. Other teachers for my era at the senior school are: Mrs Cowl (think that’s the right spelling), she was a cookery teacher up the side annex, Mr Rex maths, Miss Baker, she took French, when she retired she grabbed the books from her desk, screamed and threw them all up in the air. She was replaced by Mrs Merryfield, then there was Mr Bear, the RE teacher. Very happy days, I wish I could have them over again now I’m retired, despite what people said about our school and estate I found it great with great friends and had a wonderful time. God bless all the old Coombers, perhaps some others might have the memories nudged by what I’ve written. Fingers crossed. Hi all, me again. A quick correction: Mr Sharp wasn’t the Headmaster, my mistake, he was the head of Pelham Street College, Brighton which I went to after I left Moulsecoomb. The Head of the seniors school at that time was the one and only “Streaky” Evans (he got the nickname of Streaky due to having the build of a piece of streaky bacon). Hi, I went to Moulsecoomb infants middle and senior school. Wasn’t Miss Sharm called Guirt? I don’t know why. I knew a Pam Smith who told me poor old Guirt had died. I remember her saying, “My God”, to me. “She was over a hundred when I was at school”! Miss Smith ended up being head mistress at Patcham Fawcett and Miss Roust, the head at Moulsecoomb seniors, left her body to science! Does anybody know the name of the cookery teacher up at the annexe next to the craft class? I think her name was Miss Dawson, always wore trousers. In those days it was not heard of. Oh, my goodness! I could go on for ever, so ta ta for now.